It's the early evening here in Australia on Valentine's day, and our day has been anything but romantic. We woke up early to go to the other side of town our our little league t-ball game. Then straight home to change clothes and out to a birthday party for one of my sons friends. Attend party for two hours, then drive to another party for another friend of my sons. Attend party for two hours, then find where my husband was with our daughter and catch up with them. We didn't get home until around 6pm. There goes another potential day for swatching! Maybe we might cuddle up on the sofa tonight and watch a movie or something. 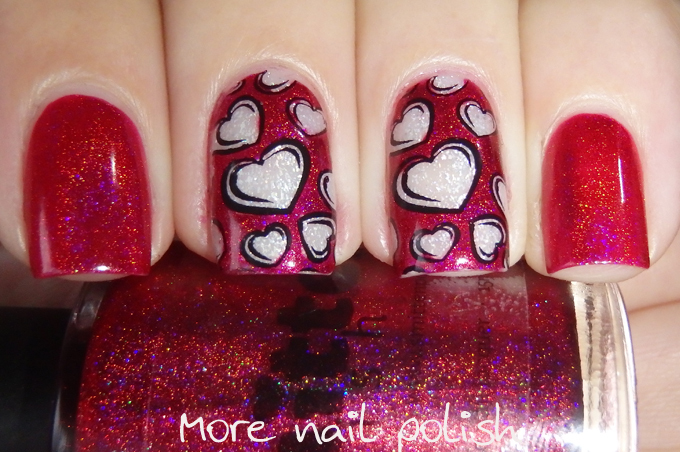 Despite our non romantic day, I did have some pretty lovey dovey nails. 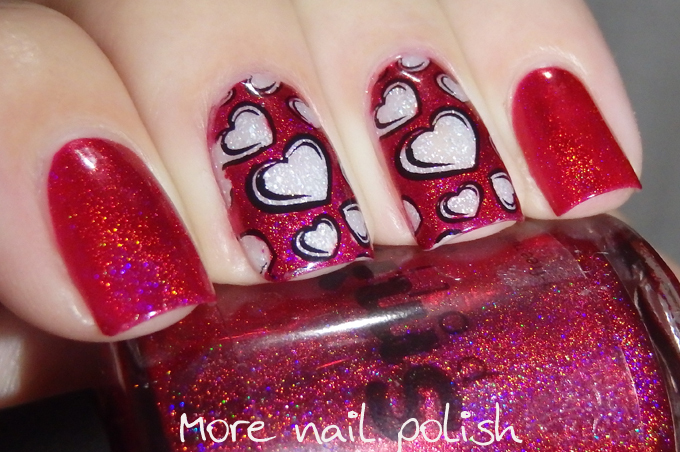 I used two coats of Smitten Polish Nose so bright which is a incredible red holo! It's super pigmented, so I ensured I had a good base coat on. On my middle two fingers I did a base of Anna Gorelova The Snow Maiden from the winter collection. I'll have swatches of that polish for you soon, as it's a stunning white scattered holo! 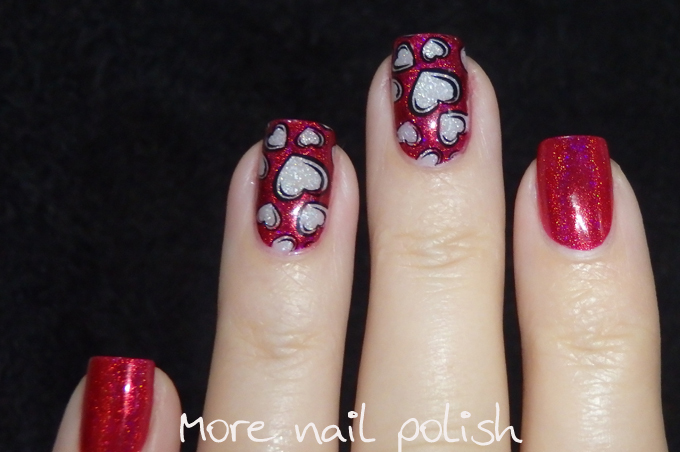 I did some advanced stamping using the hearts pattern from a Bundle Monster plate. 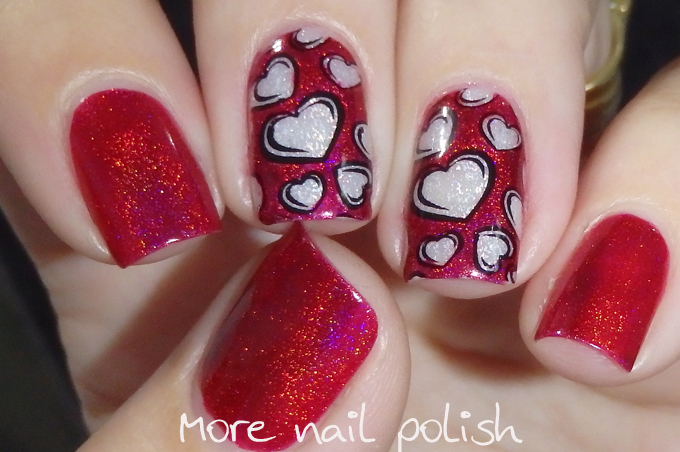 I stamped in black and then coloured it in around the hearts, on the stamper using Nose so bright. When that was dry, I applied a coat of top coat to the nail and let it dry for about 1 minute. 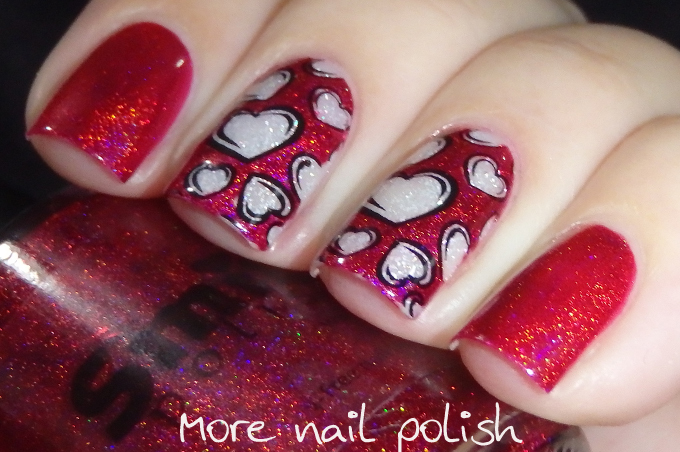 I then pressed the stamper onto my nail to transfer both the red and stamping onto the nails, leaving the white to show through in the middle of the hearts. LOL, I was worn out just reading all you did! Sounds like a very busy day. At least you had fabulous nails. I love it. Those polishes are gorgeous, I especially love that shimmering white. Hope you and your hubby were able to have some quiet time in the evening!